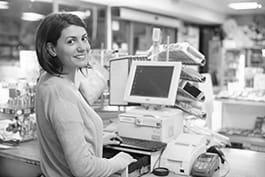 Cashiers accept payments from customers and give change in respect of sales and services. Greet customers entering establishments and answer customers' questions about e.g. products and services. Count money in cash drawers to ensure that amounts are correct and that there is adequate change. Establish or identify prices of goods, services or admission, and tabulate and total bills using e.g. cash registers, optical price scanners, bar code readers or calculators. Receive and record payment by cash, cheque, credit cards, vouchers or automatic debits. Issue trading stamps, redeem food stamps and coupons, and process loyalty cards. Remove price tags, special security tabs, etc. and, if necessary, pack goods. Resolve customer complaints and provide information on procedures or policies. Maintain clean and orderly checkout area and stock it with change, till rolls, carrier bags and other items. Calculate total payments received and reconcile takings with receipts and till rolls, and maintain other transaction records.